Assessment and screening has been completed to decide on a list of children for surgery, varying from 15 months to 12 years old. We will introduce a few to you as the week passes. Unfortunately, one of the children short listed for surgery passed away just before we arrived. This is a very sad reality of the work we do. In Australia, it probably would not have happened. However this is Cambodia. The waiting list is large, and visiting team such as ourselves try our best to meet the needs of as many as we possibly can in a short period of time. 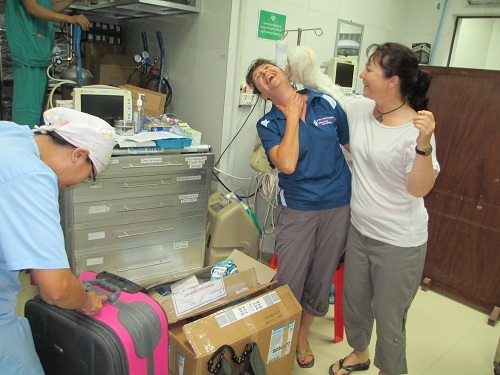 Our problems with the freight continue but remarkably theatre staff Kym Stuart and Maree Standaloft are not stressing. In fact, it only took them 2 hours to source all the supplies and equipment required for the week. 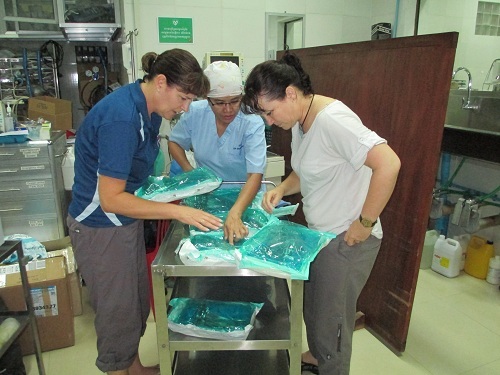 We had left a lot of equipment from previous trips and, with the emergency supplies we brought, along with the Cambodian supplies at the hospital, we had been able to commence work. We also have a back up supply from our colleagues from an American visiting team. We thank them for their generosity – it is always great to be able to work together for one cause. 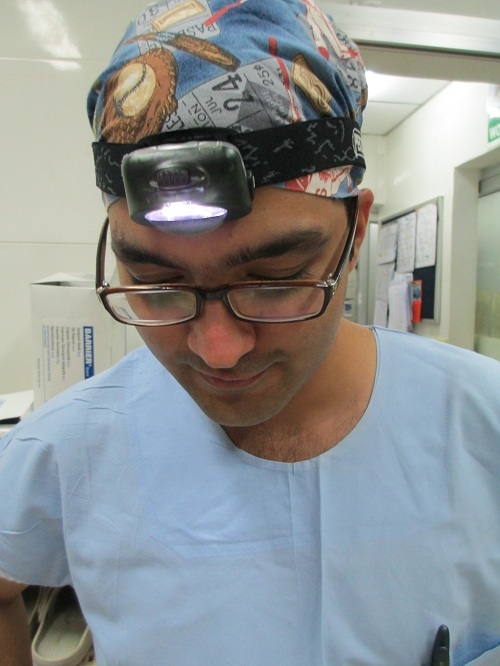 Surgeon Aishish Ketawa (Left) tests the emergency head light – a Petzel camping headlight! It might not be the power they are used to for an operating theatre, but it will do the job for now! Maree and Kym (Right below) have been amazing in scavenging, finding, and think of alternate supplies. For all the OOH regular travellers, do not panic, OT Monkey did not get stopped in customs, he is here and ready for duty! So for now, everything is smooth sailing with the first kiddie in the operating theatre.